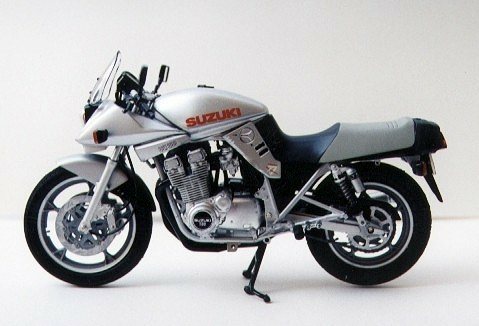 The Suzuki Katana was shown first time in 1980 at the German Cologne Show, and it gets its name from the well-known Samurai sword Katana. With great power and lithe lines it can travel at speeds up to 237 km/h. Many riders have added special parts: 4 to 1 exhaust system, stronger front and rear brakes, stronger rear suspension and many other speed accessories. Parts are excellently molded like on all Tamiya models. There are few chromed parts, thick and thin tube for brakes, cooling, etc., clear parts for windshield and turn signals, metal springs for suspension, screws for wheels and steering, and vinyl tires. Instruction sheet is very nice and everything is very clear about assembling. Engine is very nice and detailed, and has spark plugs, radiator, carburetor, air filter, etc. I removed the chrome from the chromed parts and painted it with Model Master chrome-silver color. I left chrome on mirrors only. Tubes you must glue first before you put it in the frame. I glued the tubes with CA glue. With liquid or other glue you can't attach it. They came in one big piece and you must cut them, and how long is each one you can see from assembling instructions. All parts are an excellent fit (one of reasons why I like Tamiya). There wasn't any trouble in assembling it. Only thing which I must to put filler is tank and front mask (where headlight is). You can fix bike to be on one side leg or 2-leg stand which is under bike. Best thing is that wheels are fixed with screws so they are moveable; same thing is with tehesteering. Unfortunately, the speedometer is made with decals only. For license plate you can choose between two decals ? name of motor or Japan license plate. You can make bike in 2 color scheme ? all gloss aluminium or red/aluminium combination. Tamiya recommend their Gloss Aluminium color which you can find only in spray cans, and this is only gloss aluminium color for which I know. But I transferred color from spray cans in bottles and use it with airbrush. On that way I had more control in spraying. You have decals for both versions of colors. There are decals for muffler so you can make version with carbon silencer. In the end I only can say excellent! 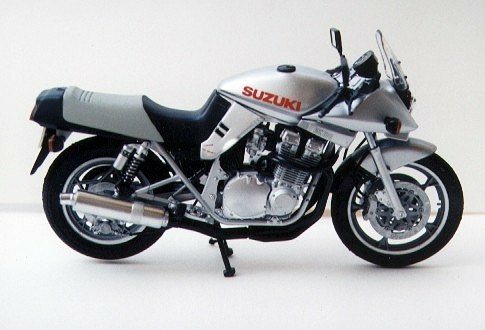 I bought a new Tamiya bike right away which is on first look even better and with more details.